1. Gather hair into a high pony tail. 2. Loop hair through an elastic band leaving the ends out and on the top of your head. 3. Divide bun in the middle. 4. Gather the loose ends into one section and pull it directly back behind the bun. 5. Pin into place with bobbi pins. this is amazing. your hair is just unbelievably amazing. so jealous! i had no idea how easy this was! well...looks easy...haven't tried it yet but i am so excited to try! hope you are having the MOST amazing time in Paris!!! 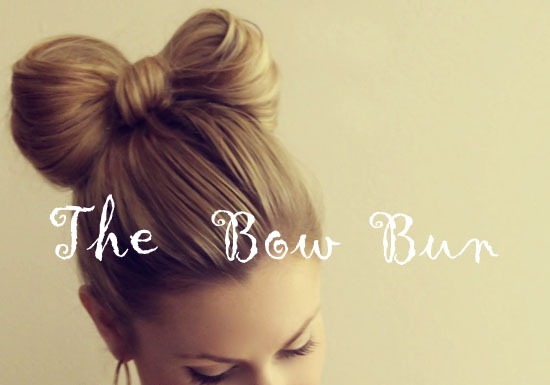 I always do my hair like that but have never tried the bow bun!! thanks!!! who would have known it could be so easy! this is amazing!! i wish you could come over and do it for me... b/c i think i'd totally mess it up!!! I'm trying this later on today! Thank you for the tutorial! Wow, who would've though it was that easy do to? Your hair is gorgeous, I can't to try this once my hair is long enough! How cute is this hairstyle!! I love it and will definitely have to try it when my hair is longer! I am going to try this asap! 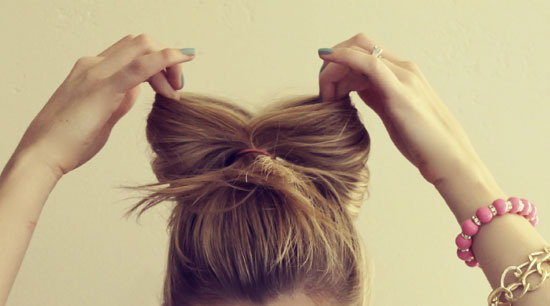 Love the idea of having a little "hairbow"! This is too cute! I love! Wow, I had no idea it was this easy. Can't wait to try it! SOOOO adorable. I need to try this! YES! I can't wait to try this. I have so many layers in my hair that it's rare that these fun styles work for me, but I'll definitely try it! :) Thanks for the inspiration! I'm rocking a boring bun right now. I think I'm going to try this on my lunch break. I love this! Totally trying it! haha i just ran into the bathroom at work and did this! this is so great thanks for sharing!! you look gawwwgeous! and i have to agree with everyone. your hair is so amazing! stop it right now!!! this is so incredibly smart, can't believe it's never occurred to me. it's official: i'm wearing a bow bun tomorrow!! oh my gosh that is so cute! and it looks so easy! how genius is this?!! thanks for sharing! I've tried to do this myself a few different ways, but this one is by FAR the easiest- thanks! Thank you so much for sharing this, I love this hair style, but I had no idea how easy it could be! duh so easy! love it, ill be trying it! I'm going to try this but I don't think it's going to look as good on me as it does on you! great look! Pinning this! It's so quirky and adorable. Wow you make this look so simple. Great hair tutorial. I wish my hair was long enough to pull off the look. So jealous!! No way!!! oh so trying this tomorrow!!! Hmm may have to wake up 2 hours earlier in order to get it right! this is awesome! I love that you did step by step pics to explain. As much as I want to try this im convinced that my layers are gonna make this hard to pull off. I will try! I had NO idea this was so easy!!! Thanks for the tutorial! Can't wait to try it! This is the sweetest hairstyle! Thanks for sharing! oh so cool, and easy! Look at you! Katie, you're so creative and so gorgeous!! Holy crap! That is so much easier than I thought it was going to be. The finished product looks so complicated, but it seems pretty simple to execute! I'm going to try it out this week...I might have too much hair though. Well see how it goes..
Love love love this! I'm going to have to try it! Amazing! your hair looks beautiful. omg. this post is amazing. Ohmygosh I would've never guessed how easy this look was do! It looks so cute on you! simply unbelievable i LOVVVVe it ! Just came across your blog!! This is a lovely hairstyle! Will have to try it somehow, and see if I can get all of my hair into it! Always wanted to know how to do this. Had no idea how easy it was. Definitely going to give it a try. Thanks for the great how to. My daughter loves your blog. I am thankful for turning her into one confident young woman. She wanted to become a very good journalist like Richie Benaud and with the kind of drive she has right now, I'm pretty sure she can achieve it.